To strengthen the level of preparedness in any organization, the planning process is only one component of the cycle. It also takes an organized infusion of ongoing training, exercises, and a systematic evaluation component that validates the system's strengths, as well as its weaknesses. The State of Kansas follows the principles set forth through the Homeland Security Exercise and Evaluation Program (HSEEP) doctrine. These principles provide common exercise policy and program guidance that constitutes a national standard for exercises. Capability-based planning approaches have become the foundation for developing exercise progams and associated objectives. By building capabilities suitable for a wide range of threats and hazards, planners can optimize efforts and resources and tailor attention on priority issues and realistic conditions. The State of Kansas Continuity of Operations (COOP) Planning Committee has identified seven (7) desired COOP capabilities to guide exercise efforts of state agencies. 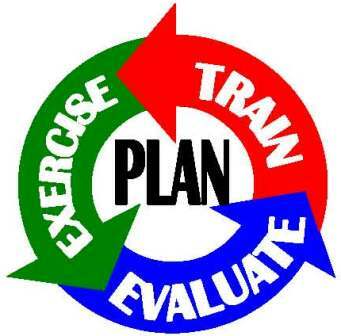 Another key element in exercise program development is developing a multi-year training and exercise plan. This allows key stakeholders to identify specific needs, priorities, and direction for enhancing preparedness goals.